What counts as fluid? - Medtrition, Inc.
A common question regarding Gelatein, a high protein oral nutrition supplement, is “does Gelatein count as a fluid” similar to that of a traditional gelatin dessert. Gelatein 20’s – average = 80.31%- 3.2 ounces per 4 oz. cup. 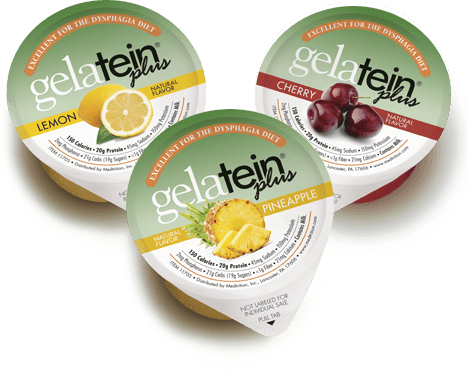 Gelatein Plus – Average = 68.72%- 2.72 ounces per 4 oz. cup. 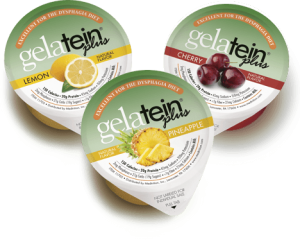 The difference between Gelatein and traditional gelatin dessert is that gelatin desserts are thickened and stabilized with gelatin which is easily broken down by the amylase in the mouth and the acid in the stomach. 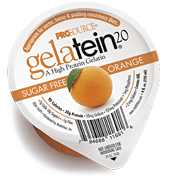 ProSource Gelateins are stabilized using carrageenan and locust bean gum in which some of the water is carried through the digestive system as is typical with gum based stabilizers. The science on this is not exactly perfect but the manufacturers of both gums have recommended that less than the full amount of water – as much as 50% – in the formulation not be counted for hydration- that would mean that approximately 1.3 to 1.55 ounces of water per 4 oz cup be counted as fluid. This entry was posted in Blog on September 20, 2018 by Karen Sudders.